I’am a second generation zoo keeper and have been around the zoo since I was a boy. 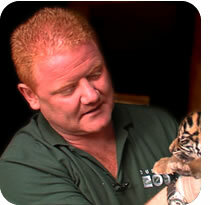 I’am operationally responsible for all of the animals, but I spent many years working with the big cats and elephants. Which are your favorite animals in the Zoo? No, my 3 year old daughter Mia keeps me too busy, but I recently got Mia a pony. I have many happy memories but the birth of the first Asian elephant Asha was an amazing experience. I’am very proud of Dublin Zoo’s participation in breeding endangered animals, and the birth of any animal here is special. I guess its always sad when a animal dies that you may have taken care of for many years. I have a wonderful daughter that takes up all my time and her favourite place is Dublin Zoo.